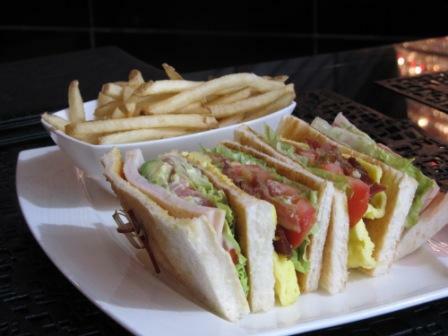 Hong Kong high tea food is a must on our agenda in every Hong Kong tour. In the past, high tea was more like buffet (coming soon - link to Hong Kong Buffet Food page) , a cup of coffee or tea, ice-cream.....nothing fancy. But at that time, it was like out of this world already. Well, living standard of Hong Kong people are getting better and better every day. So as the expectations of Hong Kong high tea food. My hubby, Perry, loves to go to The Peninsula for high tea. It used to be about 20 minutes max of waiting. Last time (Oct 2012) when we were there, the shortest estimated wait time was at least an hour. 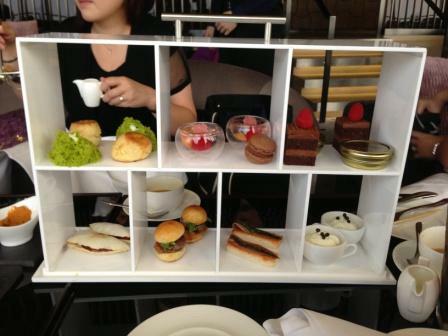 We saw the food serve in the high tea while we were waiting. Basically, nothing major changed compared to all these years we have been to. It comes with 3-tier pastry platter and a cup of tea or coffee for each person. It has been like this since we were dating 10 years ago. The table setting is the same as before. All tablewares are silver. It is good that it is still so elegant and classy. It is "bad" because Hong Kong people love changes. What I saw the change was the crowd. In the past, the customers were mostly local. Now, they are mostly tourists. Unlike the last few times when we were here, we didn't wait for the table. Instead, we went to 1881 Heritage (coming soon - link to Hong Kong 1881 Heritage tour page). High tea in the Peninsula Hotel Hong Kong starts at 2pm. We left the Peninsula and headed over to this historical building through a pedestrian subway. We passed by a retired fire truck. 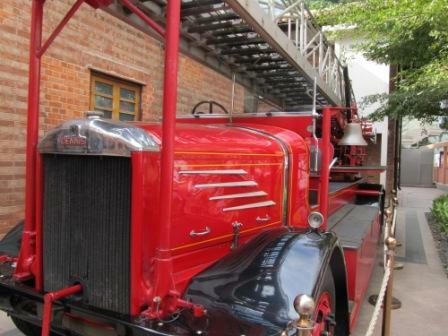 My little one fell in love of this place right away because of this fire engine. I remember a couple days before the day of high tea, we were in the same area. Both Perry and I saw this building and was amazed by its beauty of it. It used to be an old abandoned building sitting at the corner of a busy street. The day when we had our high tea, a newly wedded couple took pictures here. If that happens, you can imagine how beautiful the place is. It is a former Marine Police Headquarter (coming soon - link to Hong Kong 1881 Heritage tour page) that the Hong Kong government decided to keep it as one of the historic monuments. The main building is breath-taking. We were expecting that we would see a lot of relics inside. However, there was not even a small museum or gallery. There were just a couple displays of the original building. The bomb shelter has been preserved as a passageway to the Heritage Hall which blend in with the modern architecture. The rest of it was remodeled to be another luxury shopping mall. I was a little bit disappointed. But at the same time, I understand that it has a very high value as a piece of Hong Kong property, especially in Tsim Sha Tsui. 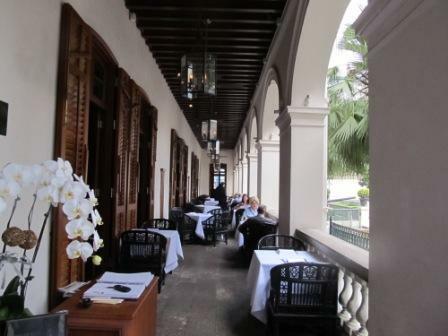 One of the best places for Hong Kong high tea food, the Parlour at the 1881 Heritage Hong Kong. Our table was over the end. We stopped at the very first restaurant we saw on the balcony, the Parlour. There are 5-6 restaurants on the same level. To get to the other restaurants, especially those at the back of the main building, you need to go through the first 2 restaurants in the front. I know...the setup sounds different, doesn't it? Maybe that's the reason why most of them were not packed. It could be also because of the time of our visit. We sat on the balcony with nice breeze. Perry said, "Bet it had nice view when there were no buildings in the front." Well, you may ask what is in front of the building. Actually, all the buildings in front of the 1881 Heritage are super low, especially in the Hong Kong standard. They are Art Center and the Space Museum. In front of those buildings is the Hong Kong Victoria Harbour. I wondered how it would be like sitting here to enjoy the Chinese New Year fire work. We ordered our high tea. My little one and my husband ordered their home-made ice-cream and purposefully asked to skip the fruit and all the toppings. My 2 picky eaters decided to skip the toppings and the fruits on the ice-cream. 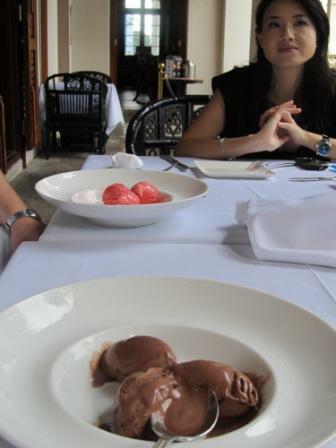 That raspberry sorbet (on the far end of this picture) got my hubby craved for it all the time. Men, oh men....has Perry hooked with raspberry sorbet since then. None of the brands he came across after this meal could compare to what they served here, according to my hubby. 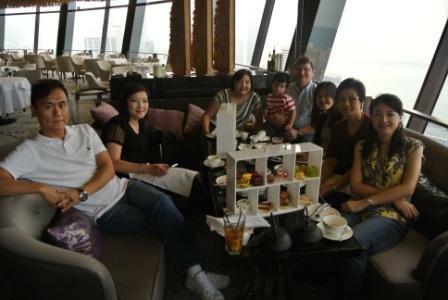 My family and I love our Hong Kong high tea food here, too. Although it was warm and foggy that day, the atmosphere and environment of the restaurant was awesome. It was quiet and felt like we had a little escape from a crazy, busy city for a little while. 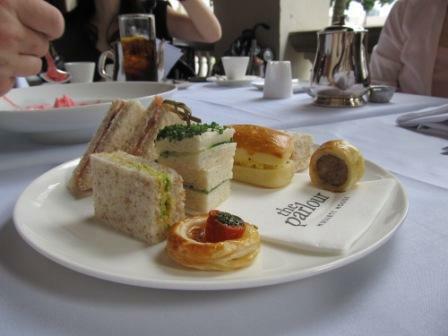 The Parlour also served 3-tier pastry for high tea like the Peninsula Hotel Hong Kong. This is one of the tiers. This meal of Hong Kong high tea food cost us HKD800 for 8-9 people which was comparatively cheap with that kind of quality of food and environment. And I got to say that it was cheap compared to any Hong Kong high tea food we had. I HIGHLY recommend this place for anybody who is interested. Nice presentation, huh? When we saw this tray was carried towards our table, we were so worried that the food might slide and fall. But then, as soon as it was set on the table, the wait staff lifted the glass cover, which surrounded the whole tray, off. What do you think? Neat, huh? Hopewell Centre has been very well-known of its rotating restaurant. When I was a kid, we went to the same place, but under a different name back then, for buffet (coming soon - link to Hong Kong Buffet food page). Also, at that time, Hopewell Centre was the tallest building in Hong Kong. This was the first time for me to be here under this new name. To get to the restaurant, it takes 2 elevators to get to 62nd floor. As mentioned, the whole restaurant rotates and takes about 2 hours to complete a full cycle. The service was awesome. The food was good. Talking about appreciating the Hong Kong skyline whenever you want to look out the window and take your time to do so, this is one of the best places to enjoy it all. It is HKD500 for 2 people. When we left, they were getting ready to serve dinner. It cost about HKD800/person for dinner. I would rate its Hong Kong high tea food second after 1881 Heritage (coming soon - link to Hong Kong 1881 Heritage tour page). 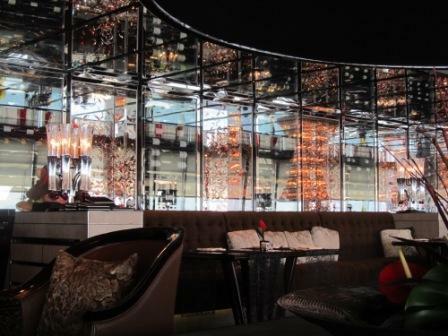 The Lounge and Bar in the Ritz Carlton, Hong Kong. Our table was next to one of these tall and humongous lamps. Aren't they pretty? Located in the tallest building in Hong Kong, the ICC Tower. We went into the hotel through the mall, the Elements. 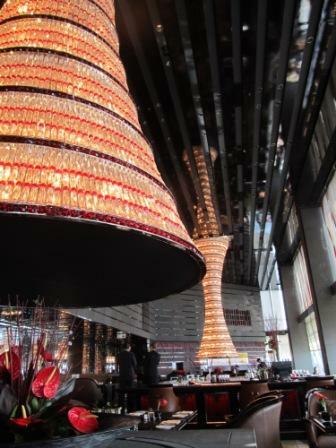 The lobby is 3 floors above Hong Kong Sky 100 (coming soon - link to Hong Kong Sky 100 Tour page). The restaurant was on 102/F. You must make a reservation because they don't accept any walk-in even though they have plenty of empty tables. Restaurants are concentrated on the 2 floors below the hotel reception. We went into the Lounge and Bar because my mom and sisters went to one of the restaurants in the Ritz Carlton for high tea once. They were very disappointed with the food. So, we decided to have a late lunch instead. We thought that we were playing safe. The restaurant is absolutely GORGEOUS. The price is 3 times more expensive than any other restaurants. But the food quality was pretty poor, including a glass of a supposedly-to-be-very-good white wine. The restaurant has a very nice view of the Hong Kong Victoria Harbour. But the bathroom has the best view. Ritz Carlton would be a once-in-a-lifetime experience for all of us. I highly doubt that I would step into any one of its restaurants again, unfortunately. But this experience won't stop me from staying in one of the best hotels in the world. You can have Hong Kong high tea food anywhere in the city. All of those covered here are few of the most expensive or best in the Hong Kong standard. In my opinion, some Hong Kong high tea meal doesn't apply to the saying, "You get what you paid." Most of the time, the price is mostly for the environment and atmosphere. But my hubby always has this point of view. 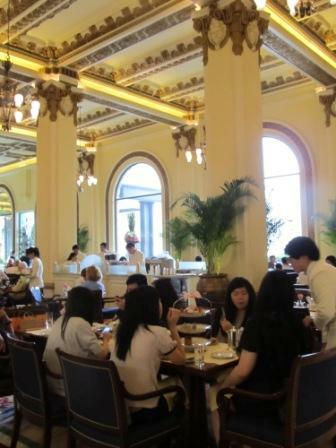 Having Hong Kong high tea food at one of these places make you feel like a millionaire. Now, that's quite a tempting experience, huh? Check back later for more high tea places. 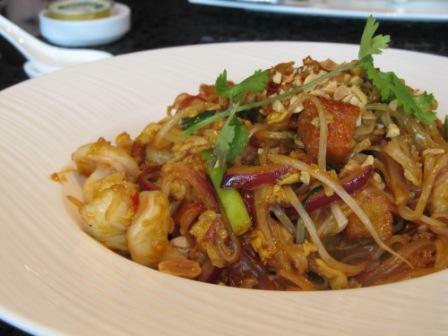 For simple recipes inspired by Hong Kong high tea food, click here. Check out our Facebook page for our photo albums.